I made this banner to hang on my piano this autumn, and decided to offer it in the shop as a fall banner kit. The cards have dictionary leaves (layered on white cardstock for stability) also inked in brown ink. Each end has a larger maple leaf with raffia bow, and the set comes with twine and mini clothespins for hanging. This is absolutely adorable! It's just perfect on your piano. I think I may try my hand at making one too! 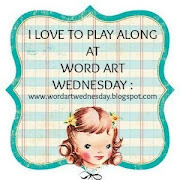 Thank you SO much for sharing this with us at Word Art Wednesday! Oh, what a beautiful banner to hang from your piano, and I love the leaves! I never thought of using a dictionary (which we never use any more - hehe!). And I love the small clothespins and with the raffia bows. Absolutely lovely! And we sure are blessed so, aren't we? Thanks for stopping by my blog. It is a joy to visit you!! Hugs! This is so pretty! My daughter has a piano like yours, I never thought about making a banner for it. What a fabulous idea and an absolutely striking decor item! It is always good to slow down and appreciate our blessings, and this is a great reminder to do so! That is so cute, I love how you have it hung by clothes pins, great idea! LOVE this banner!! Sweet! Thanks again for sharing with us at Word Art Wednesday! Blessings! First, let me say that your BLESSED banner is so sweet. Second, let me tell you how much I LOVE your sweet old piano. Mine is very old as well (much loved as I like to say) and it is still in my Mom's basement in Minnesota. It's a dream of mine to get it here to my home in Nevada. Anyway, I am SO incredibly grateful to have you share your wonderful talents with us at both Word Art Wednesday and CropStop. I always LOVE seeing your amazing art. Have a blessed week, my friend.